May is Short Story Month, and I’ve had such a great time reading and discovering old and new short stories and authors! I’ve been sharing my reviews and recommendations on my Facebook Page, on Twitter, and on my blog. All my Short Story Month posts, and other posts about short stories, can be found here on my website under the tag “short stories“. My 10 favourite Ray Bradbury short stories. Short stories make the perfect intro to a new author’s work, a great way for readers to get a top-up from their favorite authors between novels, a perfect impulse purchase on a phone or e-reader. After years of languishing in the shadows as magazines stopped publishing them and the big prize money went to novels, short stories are poised for a huge comeback. Inspired by April’s National Poetry Month and thanks to the StoryADay in May writing challenge, May has started to become identified with the short story. 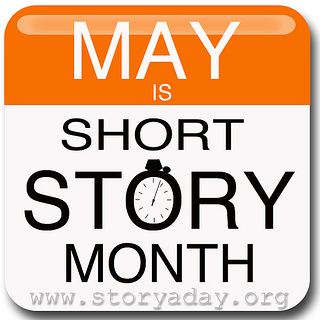 So now we’re making it official and declaring May 2013 to be the first organized International Short Story Month. You can get involved in boosting this wonderful form whether you are a reader, a writer, a publisher, and editor, a writing prize sponsor or an educator. Add a listing to our Short Story Directory. Find opportunities to sponsor Short Story Month here. Follow the #ShortReads hashtag on Twitter (started by publisher AAKnopf). And most of all, read a great story today.